While we were at my parents over Thanksgiving my dad whipped up with corn & sausage chowder for lunch one day. It seemed to come together in no time & was a big hit with everyone especially served with his homemade breadsticks. Matt really liked it so wanted to make it at home right away. We forgot to get my dad's recipe but Matt figured he could wing it. I think my dad's was slightly thicker but other than that its pretty close. This soup makes for a nice hearty lunch. The sweetness of the corn pairs beautifully with the smoky sausage. My dad uses frozen potatoes o'brien instead of chopping his own potatoes, peppers & onions so feel free to substitute that if you want even a quicker meal. In a large soup pot melt the butter over medium-high heat. Add the onion & red pepper. Cook until the onion is translucent. Sprinkle in the flour & cook while stirring for 1 minute, do not let brown. Add the stock slowly & continue stirring until bubbly. Add the sausage, corn and potatoes. Stir in the red pepper, paprika plus salt & pepper. Cover & let simmer for about 20 minutes or until the potato is tender. Stir in the milk & heat, do not boil. Check seasoning & add salt, pepper & hot sauce to taste. I want soup for every meal to warm me up. It is cold here! Hubs left for the store before I read this (am supposed to be studying, not blog reading) but I think I can call his cell to pick up corn! It's the perfect soup for the next couple of days. kat & Matt - Love the addition of the smoked sausage. 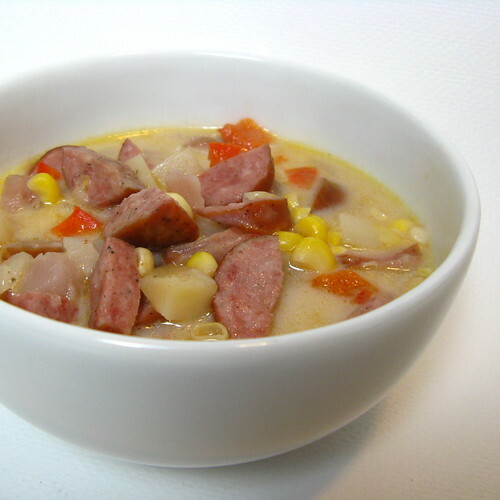 I have always used thick slab bacon to accent my corn chowder, but I bet the sausage takes it to another dimension. Here is a suggestion I passed on to Pam @ "For the love of cooking" - take about 1 cup of kernel corn and puree it, then add it to your soup. That will thicken it and add flavor, as well as texture. I love these flavors together! Perfect for keeping the cold away! It is so cold here and a nice warm bowl of this soup would be very comforting! the pop of the corn, the chew of the potato, the taste of the sausage--this is a high quality soup. pretty, too. I bet the breadsticks were delicious too! We've been making a lot of soups lately. My husband's brother makes his own sausage, which is fabulous. This would be a good way to make a meal out of it. This soup would be perfect for a weeknight meal. Looks delicious! That looks delicious! I love smoked sausage. I don't know what potatoes o'brien is, so I think I will be cutting my own vegetables! I think I just found what it for dinner tonight. I have all of these ingredients on hand right now!